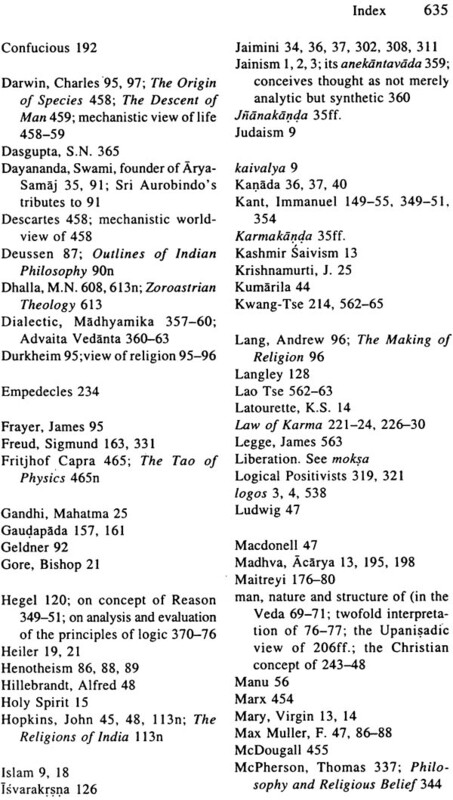 Philosophy and religion were never kept apart from each other in Indian philosophical tradition. The Vedas, the Upanisads and the Bhagavadgita provide a strong and unshakable philosophical foundation to Hinduism. In the present book, Dr. Misra has made a reinterpretation of the religious and philosophical thought to these sacred and immortal works. It has been found necessary in order to dispel the misinterpretations of Hinduism and meet the challenges that confront it today at the ideological and practical levels. The concepts of the Absolute, Brahman, of man and the world, the destiny of man and other fundamental issues have been discussed with great clarity, thoroughness and depth. 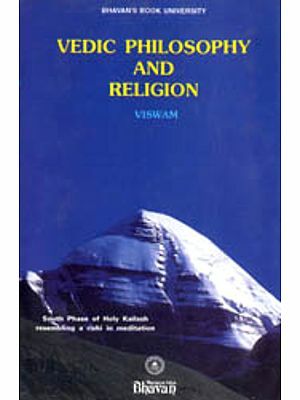 The author has brought into clear focus the unique features of Hinduism and its intellectual depth and spiritual grandeur. A distinguishing feature of the present work is that the fundamental ideas of Hinduism have been compared with that of other religion, specially, Christianity and with the great idealistic tradition of the west. The author has also made a critical analysis and evaluation of some current ideas in contemporary western thought. The present work provides ample evidence of the author's conceptual ability, originality and intellectual integrity. Dr. R.S. Misra is a distinguished interpreter of Indian Philosophy and religion especially of Vedanta and Buddhism. He was Malaviya Professor of Comparative Religion at the Banaras Hindu University from where he retired in 1983. His published works are: The Integral Advaitism of Sri Aurobindo: Studies in Philosophy and Religion; and Hinduism and Secularism. He has also published several articles which have been published in leading journals in India and abroad. The Vedas and the Upanisads constitute the perennial source and foundation of Hinduism. They have provided a strong philosophical foundation to Hindu religion, culture and way of life. A most notable feature of Vedic religion or Hinduism is that philosophy and religion were never kept apart from each other. Philosophy has always provided a strong foundation to religion at the ideological level right from the Vedic period upto this day. Thus Vedic religion or Hinduism has never been dominated by theology. I have discussed this issue in the very beginning of chap. 1. Hinduism is all-encompassing in character. It has within its fold some great religions, namely, Vaisnavism, Saivism and Saktaism. They constitute different and powerful streams of Hinduism and find their ground of unity in the Vedas, the Upanisads and the Bhagavadgita. A most distinctive feature of Hinduism is that it is not centred in one sacred book, one sage or prophet and one way of religious life. It is also not governed and directed by any all-powerful organization like Roman Catholic Church. It has given ample freedom to people in respect of faith and belief and way of religious life. 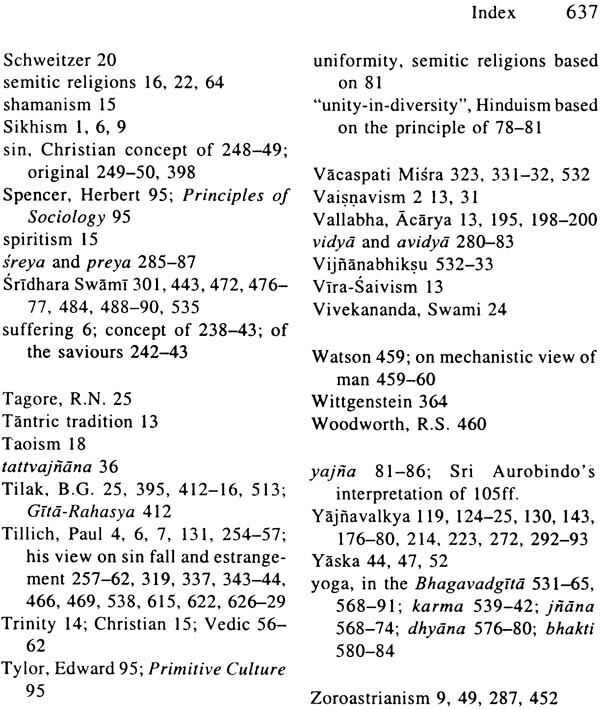 Another most unique feature of Hinduism is that it is based on the principle of "unity-in-diversity". In this respect, the approach of Hinduism to religion, life and culture is radically different from that of some other religions which are based on the principle of uniformity. Hinduism also represents the meeting ground of the prophetic and mystical streams of religion. 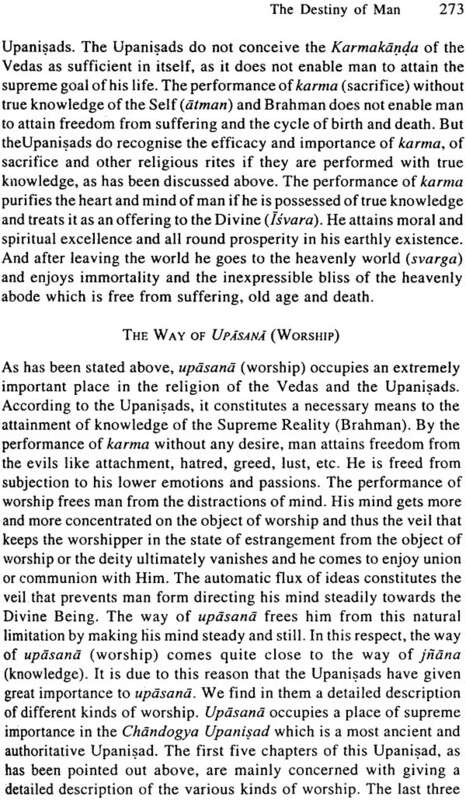 Both these streams of religion find their ground of unity in the Vedas itself, including the Upanisads. The religious and philosophical thought of the Vedas and the Upanisads requires reinterpretation today. 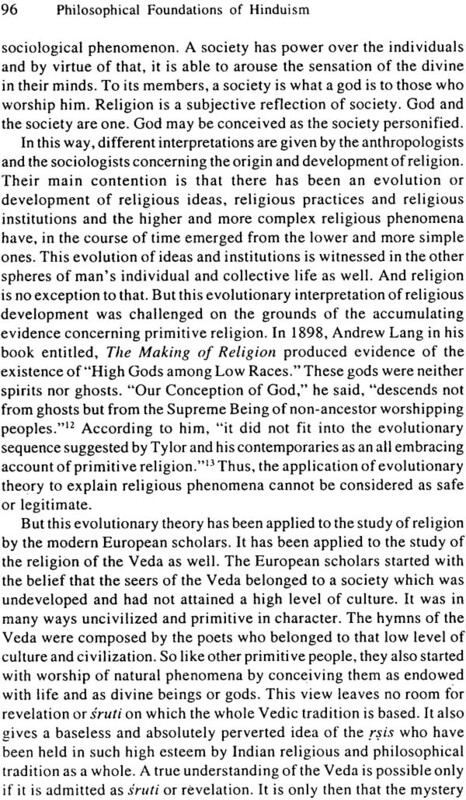 The Western scholars have presented divergent views concerning the religion of the Veda. 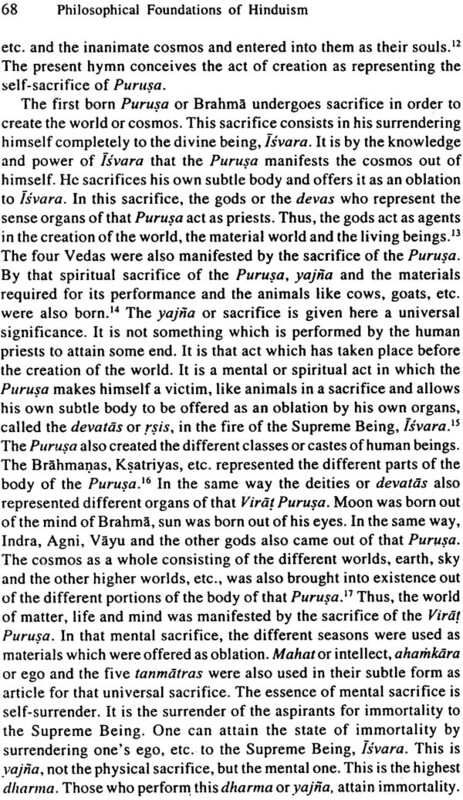 Their general view is that the religion of the the Veda is naturalistic and mythopoeic. This view is radically different from and even opposed to the traditional interpretation of the Vedic religion. So a fresh interpretation of Vedic religion and thought is now necessary and inevitable. It is also necessary because some Western scholars, specially theologians, who have made some serious study of Hinduism have presented a partial and distorted picture of it and have characterized it as life-negating, unethical, other-wordly, mystical and so on. I have made a serious and sustained attempt in the course of the present work to show that such charges levelled against Hinduism are simply baseless and cannot be justified or validated on rational grounds. The semitic background of Western scholars seems to be largely responsible for their misinterpretation of Hinduism. Some new thought-currents in the recent and contemporary Western philosophy like logical Positivism, Philosophical analysis, etc., have posed a serious challenge to religion itself at the ideological level. They have questioned the validity of religious knowledge and the meaningful character of religious assertions. A critical analysis and evaluation of their basic principles are now necessary in order to refute the charges levelled by them against religion. I have tried to accomplish this work to some extent in part III. 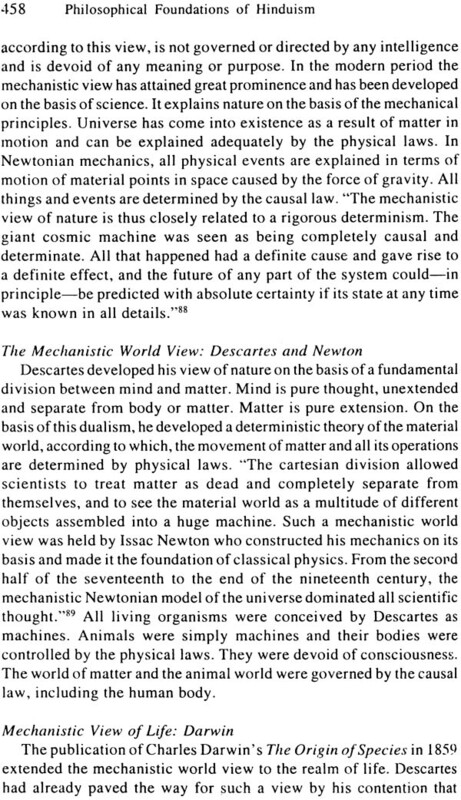 I have also compared the Vedic and Vedantic views about the Supreme Reality, man, world, destiny of man, etc. with that of some other religions, specially, Christianity. It has enabled me to bring into clear focus some unique features of Hindu religious and philosophical thought. The development in the study of Comparative religion in the last few decades in some parts of the world has brought the different religions somewhat closer to each other at the ideological level. So a serious and critical study of Hinduism or any religion is, in my view, not possible today without making this kind of comparative study. I developed interest in this kind of comparative study because I was formerly associated with the Chair of Comparative religion in the Banaras Hindu University. It provided me an opportunity to make some serious study not only of Hinduism but of some other religions as well. I also enjoyed privilege to meet and discuss fundamental religious and philosophical issues with scholars and professors of the Western countries who visited the university on different occasions. I was benefited in many ways by these friendly and fruitful discussions and was all the more convinced of the necessity of comparative study of religions. It enables one to have a more clear idea of the merits and shortcomings of one's own religion. 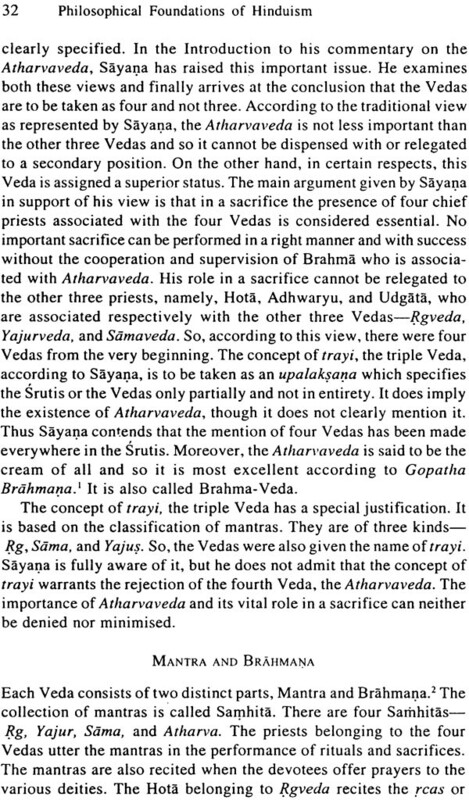 The present work comprises four parts: part I deals with the religion and philosophy of the Veda. 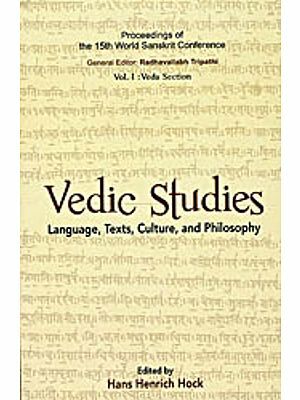 I have made a serious and sustained attempt to discuss in a comprehensive and critical way the subject- matter of the Veda, the nature and function of the Vedic deities, the philosophical thought of the Veda and some modern interpretations of the hymns of the Veda and its religious thought. The main purpose of Samhitas and Brahmanas which constitute two sections of the Veda is to reveal the nature and mystery of dharma. A most distinctive feature of the Veda is that it has been characterized by the orthodox tradition as apauruseya. It means that there is no author of the Veda. 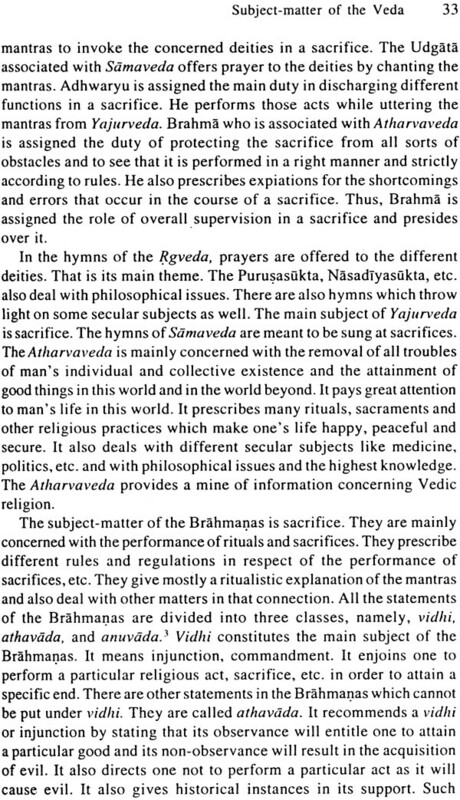 The rsis of the Veda are held by the tradition as the seers of mantras (mantradrastarah and not their authors. The Vedic religion or Hinduism is based on Revelation. The supreme truths embodied in revelation were revealed by lsvara himself to the rsis. 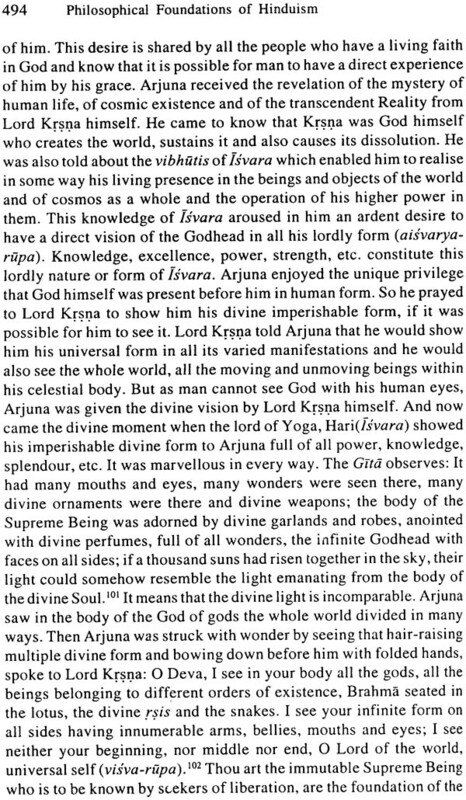 The deities of the Veda are, according to the orthodox view, divine beings. 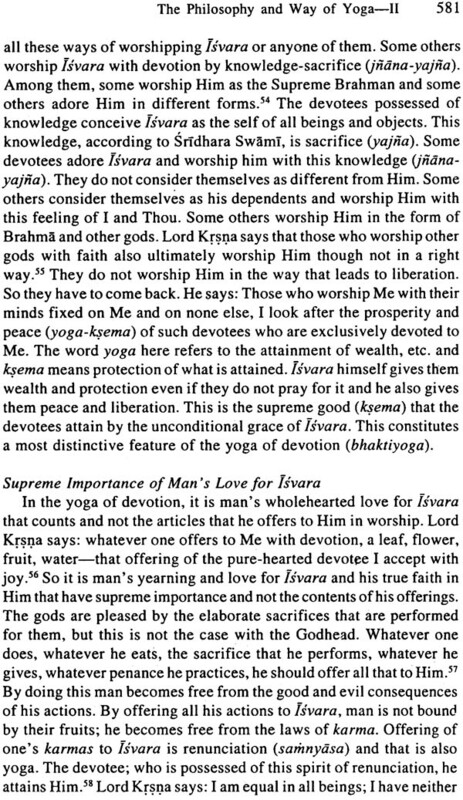 They symbolise different powers of the Supreme Being, Isvara. The various naturalistic explanations given about Indra and other Vedic deities are largely speculative in character and do not do justice to their nature and function. 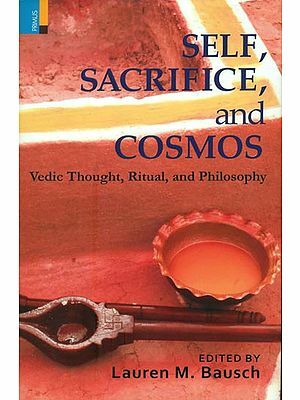 The philosophical thought of the Veda is revealed with great profundity and depth in the hymns of the Rgveda. The Nasadlyasukta expounds the ultimate cause of the world and from the philosophical point of view it is a most important hymn of the Rgveda. 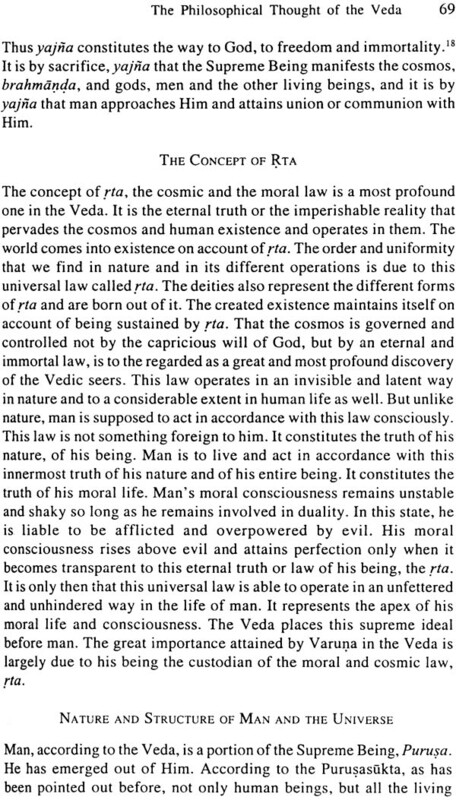 The discovery of rta, the cosmic and moral law can also be conceived as a most profound one in those ancient days. 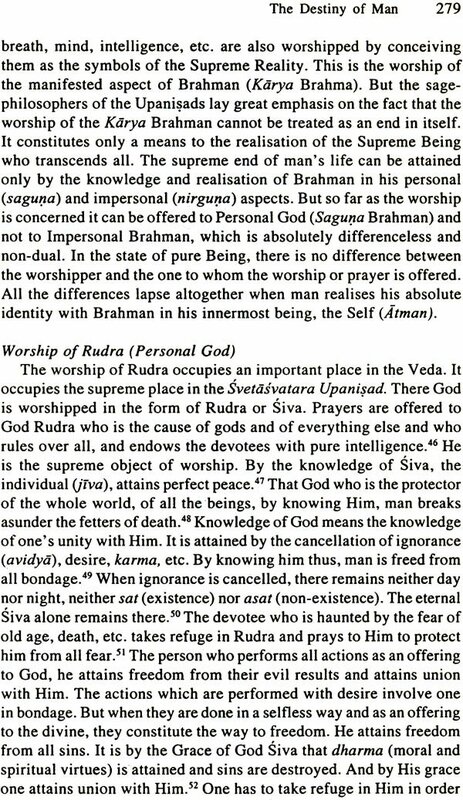 The memorable assertion of the Rgveda that the Supreme Reality, Sat is one but the wise express it in many ways shows the extraordinary philosophical insight and depth of the ancient rsis. 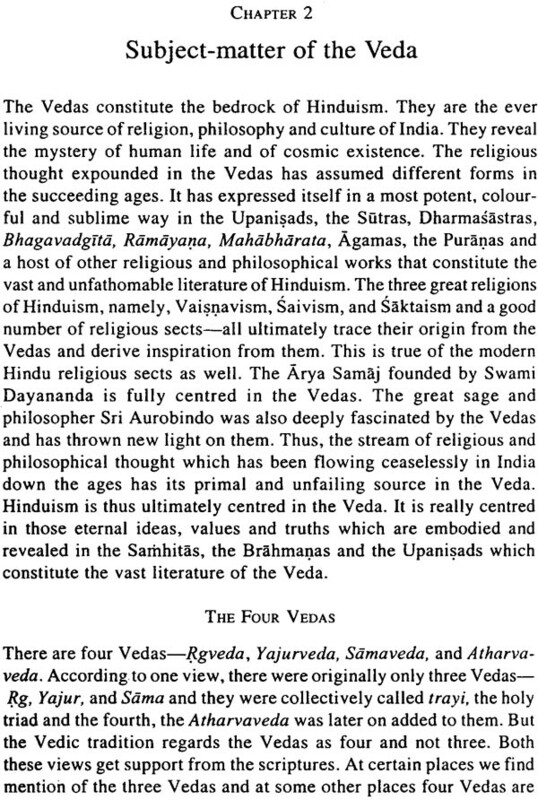 The Veda has presented an integrated view of human life by the concept of four purusiirthas. The Vedic attitude towards life in the world is robust and optimistic. The Samhitas and Brahmanas propound the philosophy of life-affirmation. This view is shared by the ancient Upanisads as well. 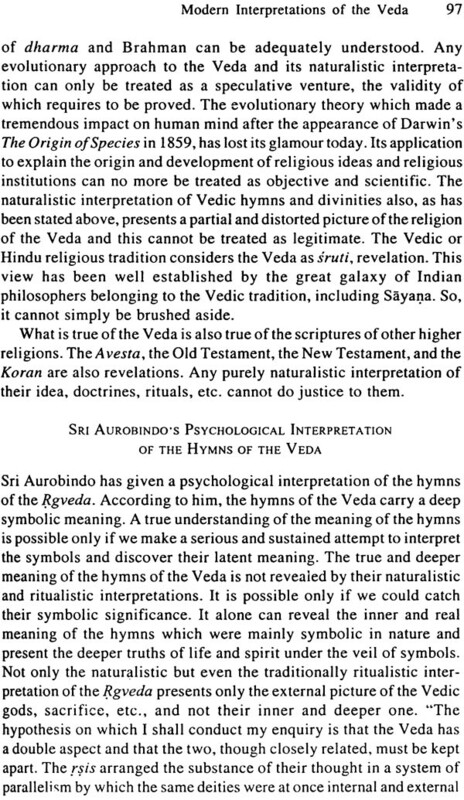 I have also made a critical analysis and evaluation of the naturalistic interpretation of the Veda and have also discussed at some length Sri Aurobindo's psychological interpretation of the hymns of the Veda. 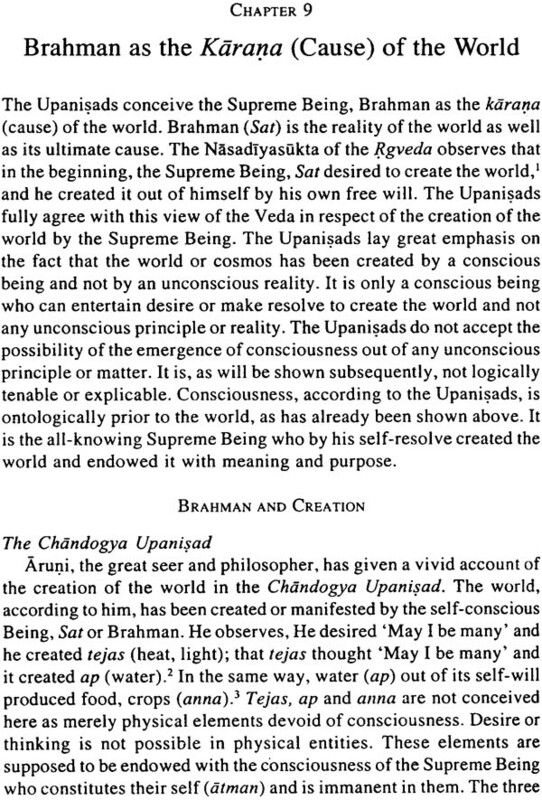 In part II, I have made a critical and detailed exposition of the religious and philosophical thought of the Upanisads. 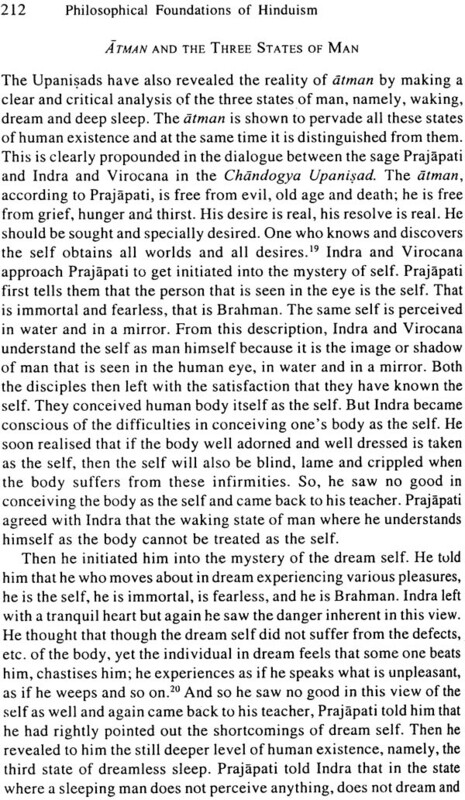 The seers and philosophers of the Upanisads have expounded the nature of the Supreme Reality, world, man and the destiny of man with great clarity and depth. 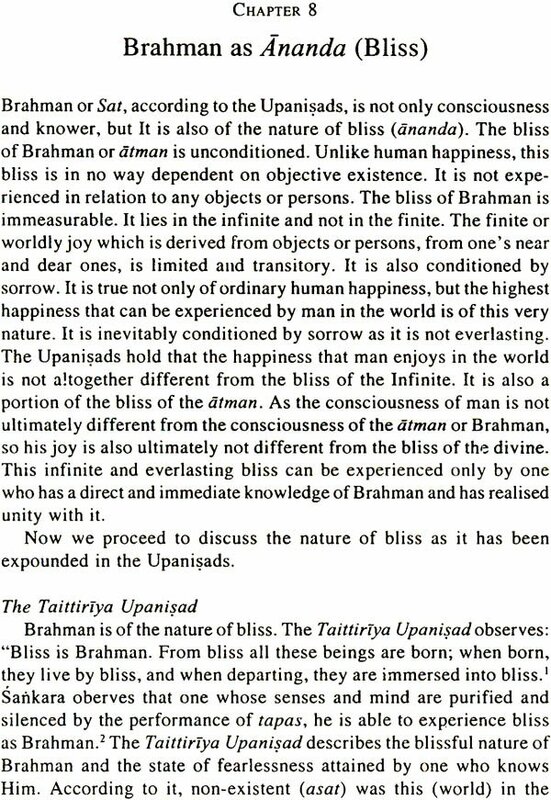 I have discussed the Upanisadic view of the Supreme Reality, Brahman mainly on the basis of its exposition in the Upanisads themselves and also in the light of the views developed about the nature of Brahman and its relation to man and the world in the schools of the Vedanta. 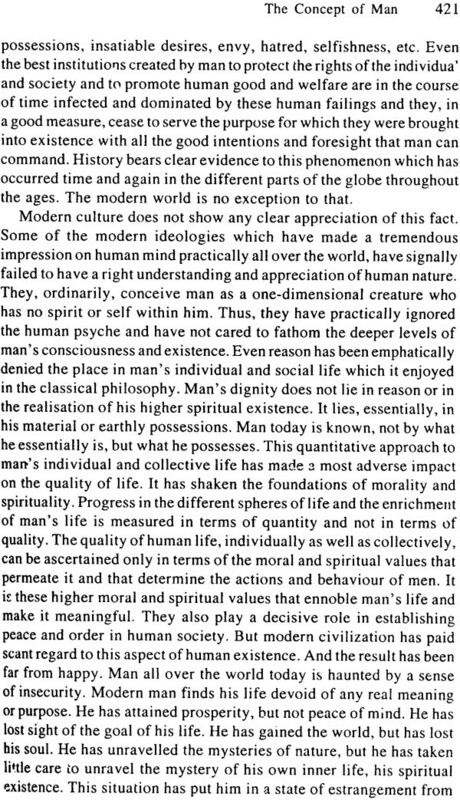 I have also made a critical exposition of the Upanisadic concept of man and man's existential situation and have compared it with the Christian view of man, with special reference to Paul Tillich. In part III, Language and Logic of the Upanisads, I have expounded the Vedantic view of religious language. I have also made a critical analysis and evaluation of some basic principles of the logical positivists and analytical philosophers who have questioned the validity and cognitive character of religious language. 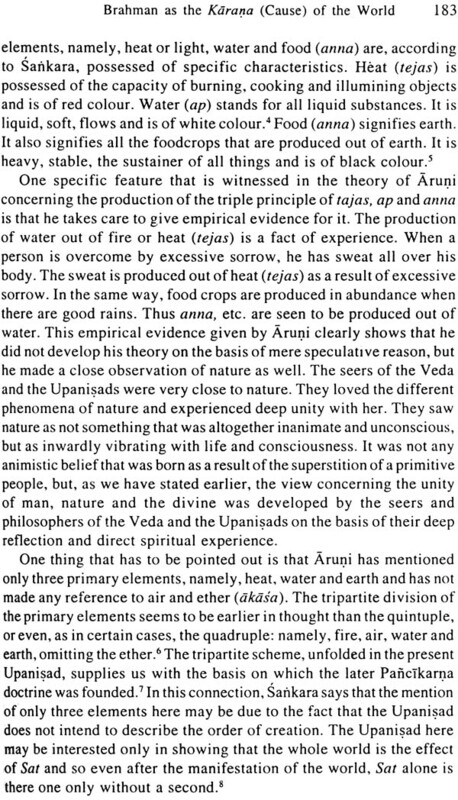 In my exposition of the logic of the Upanisads, I have made it clear that the Upanisadic view which unfolds the reality of Brahman in all its integrality and depth can be justified and accepted only on the basis of higher reason or logic which has been significantly characterized by Sri Aurobindo as the logic of the infinite. 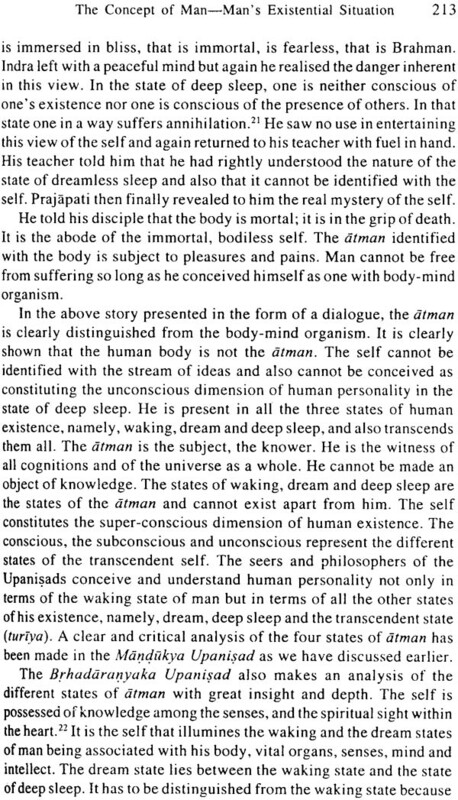 The dialectical reasoning suffers from serious limitations and cannot comprehend nature of Brahman in all its integrality and depth. 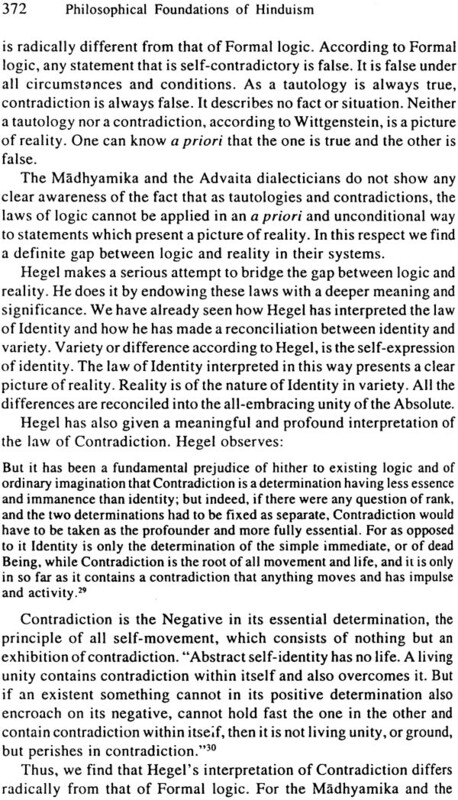 I have shown the limitations of dialectical reasoning by making a critical analysis and evaluation of the dialectical criticism of categories made by the Madhyamika and the Advaita Vedanta. The logic of the Upanisads is essentially the logic of the Infinite. I have made a critical and detailed exposition of the logic of the Infinite in my book The Integral Advaitism of Sri Aurobindo. In part IV, I have given a critical and detailed exposition of the philosophy of the Bhagavadgita. The philosophy of life of the Veda and philosophy of spirit, atman of the Upanisads find their ground of unity in the Gita. 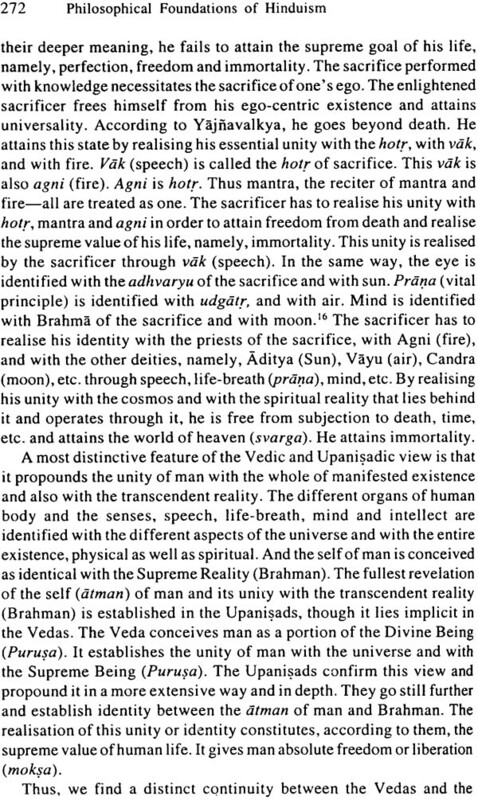 Thus a clear picture of the religious and philosophical thought of the Bhagavadgita can be presented with clarity and depth only in the background of the Veda and the Upanisads and not in isolation. 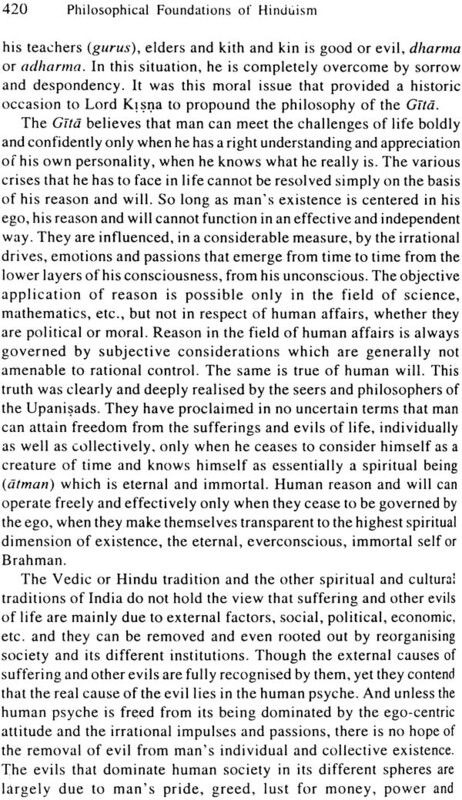 The distinguished philosophers of the Vedanta have already expounded the metaphysical views of the Gita on the basis of the Upanisads, Now it is necessary to bring into clear focus the impact of the philosophy of life of the Veda on it as well. Hinduism is the most ancient living religion of the world. It has been called by the ancient seers and philosophers of India sanatana dharma which means "eternal religion". It is not possible to trace the begin- nings of Hinduism as it is prehistoric. The first and the most ancient documents that are available on this ancient religion are the Vedas. They give a clear idea of the religious beliefs, philosophical ideas and way of life of the ancient Aryans of India who were the original in- habitants of this land. They were later known as Hindus. The Vedas constitute the perennial source and foundation of Hinduism. The Vedic tradition has considered the Brahmanas and the Upanisads as constituting an inseparable parts of the Vedas. The four Vedas, the Brahmanas, the Aranyakas, and the Upanisads are considered as constituting the sacred literatures of the Hinduism. The Aryan or Hindu race has also produced two ancient religions, namely, Jainism and Buddhism and later on Sikhism. These four great religions of India are linked together in a common bond of unity, as they all bear on them the stamp of the Hindu race. 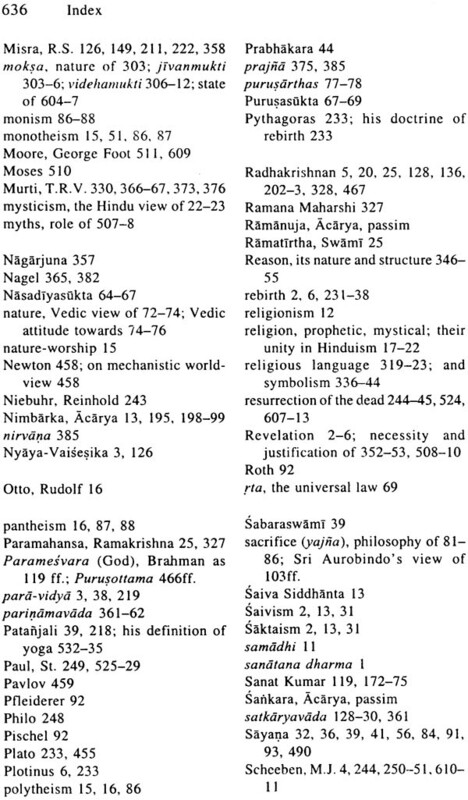 Hinduism as a whole is mainly based on the Vedas and the Smrtis. The Vedas reveal and propound the truths of dharma and Brahman, the Supersensible Reality, Sat. The Smrtis are chiefly concerned with the religious and secular life of the individual and the community. They lay down laws, rules and codes of conduct which govern the individual and collective life of man in its different spheres. Thus, the Srutis and the Smrtis taken together embrace all the spheres and dimensions of man's life. The secular and the religious life of the Hindus has been governed down the ages by the Srutis or the Vedas and the Smrtis. They not only constitute the foundations of Hindu philosophy and religion but of Indian culture and civilization as well. They embody an extremely rich and enduring philosophy of life and spirit and have developed it in all its integrality and depth. The Vedas have developed a rich and robust philosophy of life and the Upanisads a magnificent philosophy of spirit. 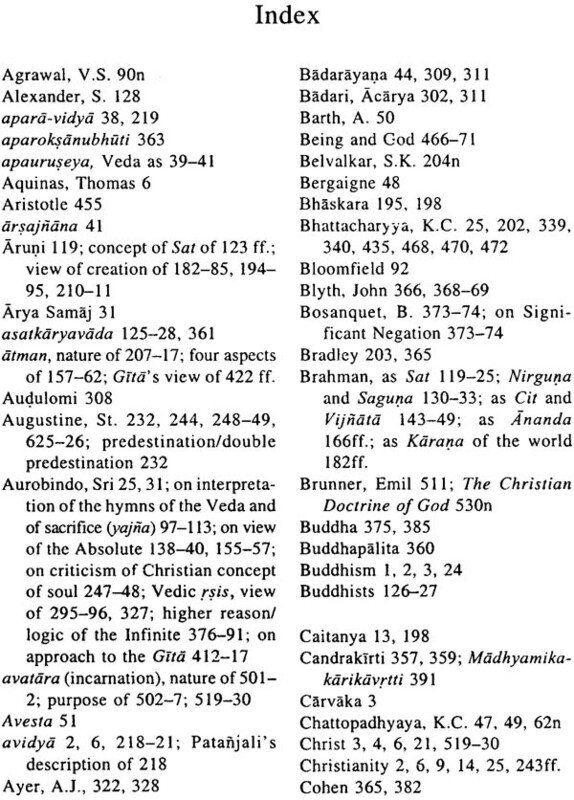 The religious and philosophical thought of the Vedas and Upanisads is universal in character. 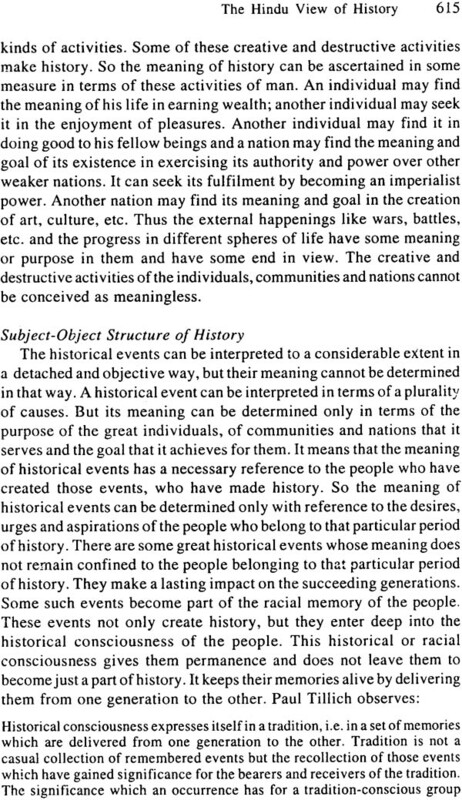 It has revealed itself in different forms in the course of history. Some great religions, namely, Vaisnavism, Saivism and saktaism and a large number of minor religious sects have emerged out of it. They constitute the most potent streams of Hinduism and have immeasurably enriched it, sustained it and have provided life and light to the people of India throughout history. The other great ancient religions of India, namely, Jainism and Buddhism do not belong to the Vedic tradition. They have their own rich religious and philosophical traditions and have developed side by side with the Vedic or Hindu tradition. As great religions, they have always enjoyed an independent status. They have made their own fundamental contributions towards the enrichment of Indian culture. Philosophy and religion were not kept apart from each other in Indian tradition. The rsis of the Upanisads were seers as well as philoso- phers. 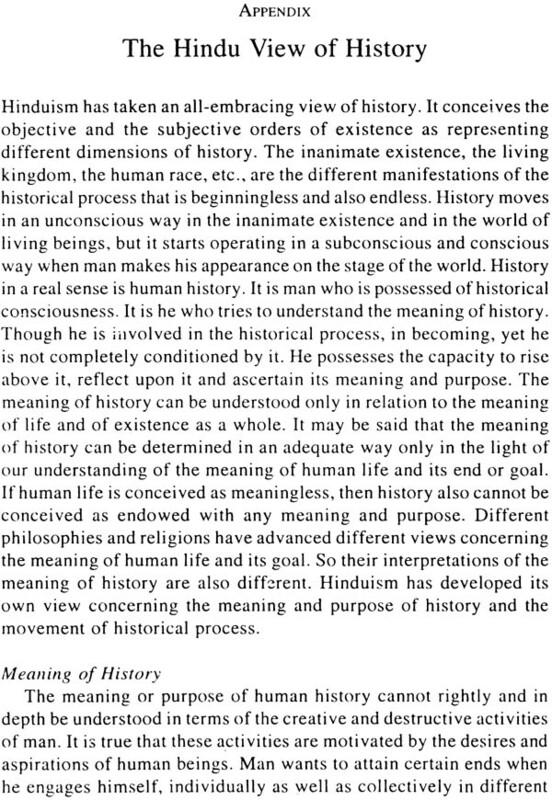 The great philosophers of India belonging to the Vedic (Hindu), Buddhist and Jaina traditions were deeply committed to religion and have unanimously conceived liberation as the supreme end of human life. They have also propounded the different ways by which the en- richment of moral and spiritual life and liberation can be attained by man. 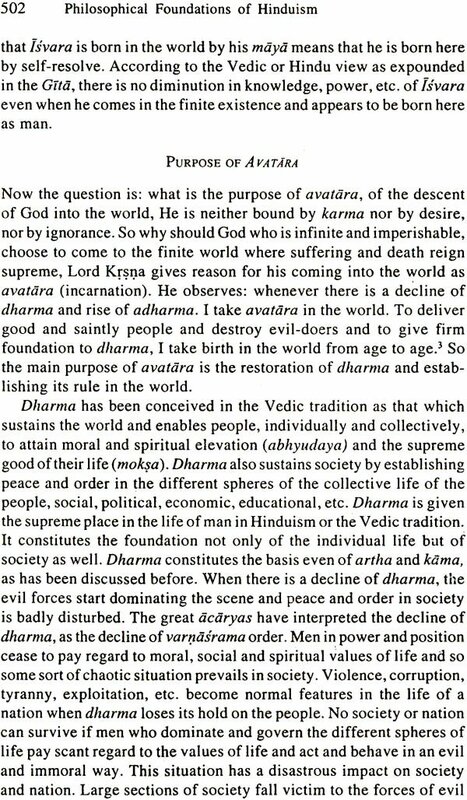 The doctrines of avidya, karma, rebirth and liberation consti- tute the common themes of the philosophical schools of Hinduism, Buddhism and lainism. Indian philosophers have made a critical analy- sis and evaluation of the supernatural and supersensible truths revealed through sruti (revelation) or spiritual experience and have interpreted and expounded them in a strictly rational way. 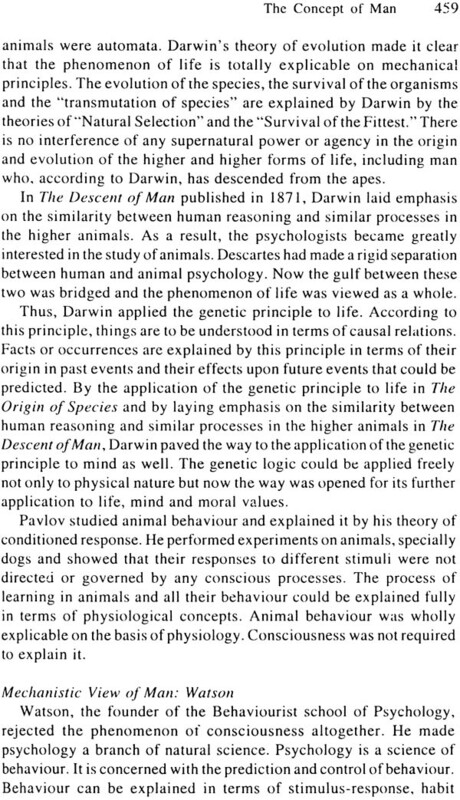 Indian philo- sophical and religious thought has never been dominated by theol- ogy. In this respect, it presents a marked contrast to Christianity whose thought is dominated and directed by theology through and through. 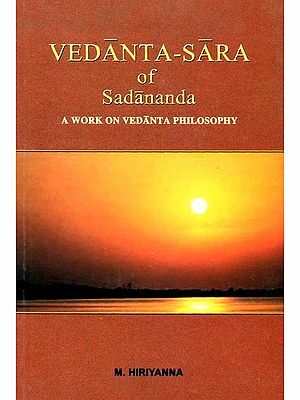 The Vedanta is directly based on the Upanisads and other sacred scriptures and the great acaryas of the Vedanta have written com- mentaries on them. But they were essentially philosophers and not theologians. 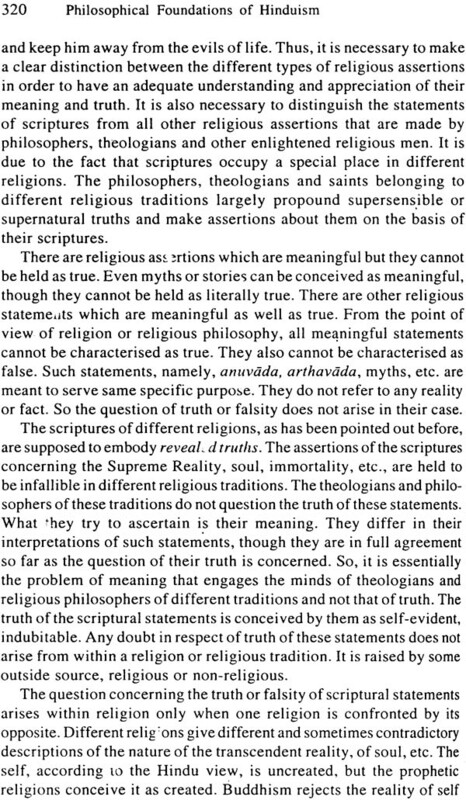 The full commitment of the Vedanta to the revealed Word embodied in the sacred scriptures brings it quite close to theology. Both are fully committed to revelation. 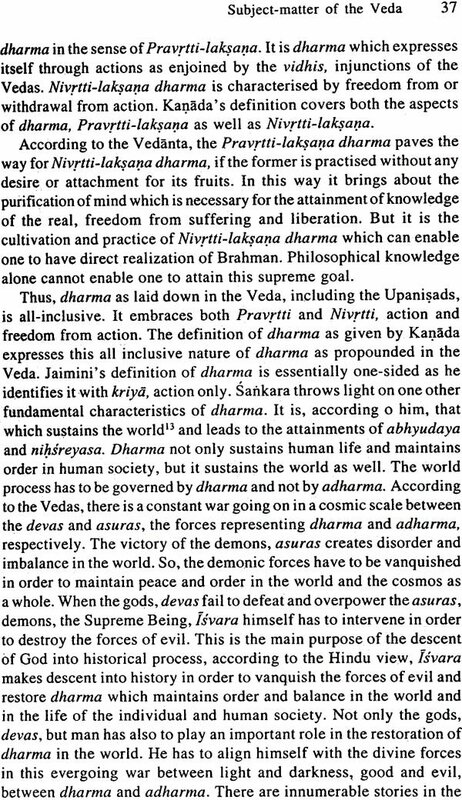 But the approach of the Vedanta to revelation is radically different from that of theology. The philoso- phers of the different schools of the Vedanta have interpreted and expounded the supernatural truths concerning the Supreme Reality, spirit or atman, liberation, etc., revealed by the scriptures, strictly on the basis of experience and reason. They have established the validity of those truths on the basis of reason and logic. The supernatural truths are beyond reason, but the propositions that express them and establish them must not violate the universally accepted laws of logic. 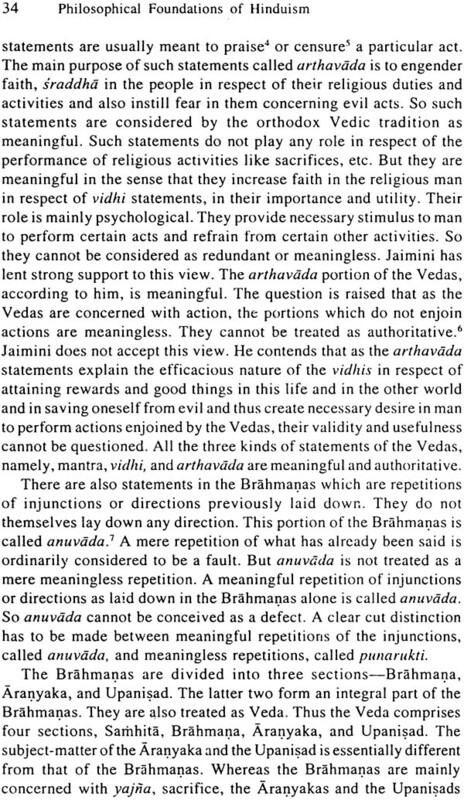 This has been the approach of the philosophers of the Vedanta, though they have put full faith in Sruti. 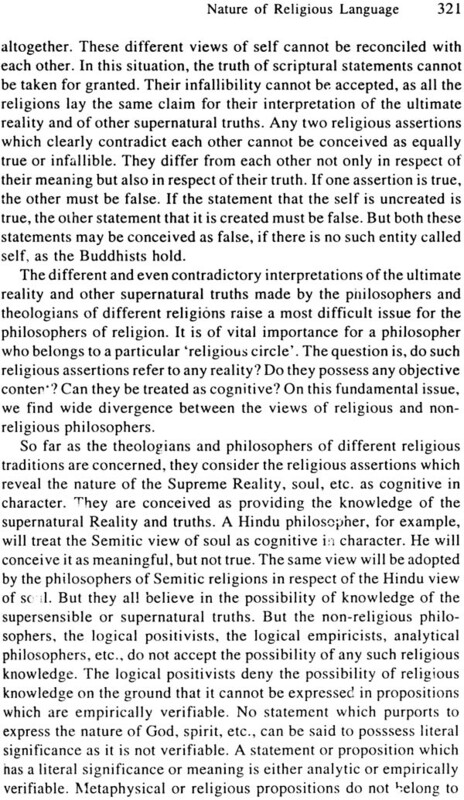 They have made a clear distinction between religious beliefs which cannot be interpreted and explained in a strictly rational way and the other supernatural eternal truths whose validity can be established on the basis of reason and logic. 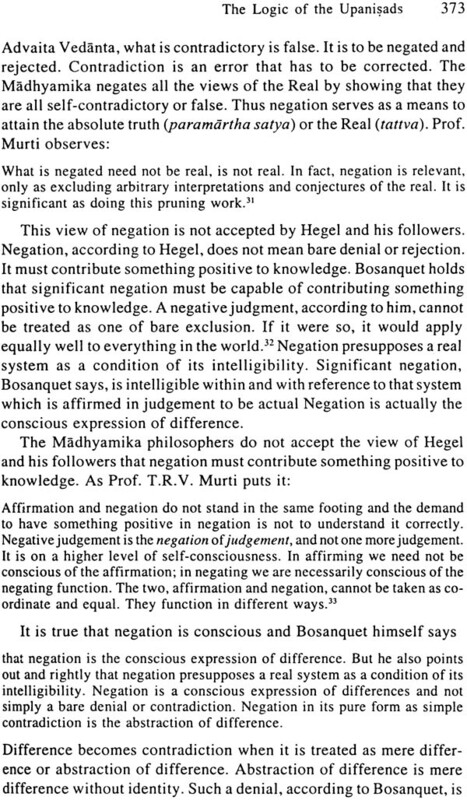 The Vedanta as a system of philosophy is primarily concerned with this aspect of Revelation which expounds ontological or metaphysi- cal truths. The Vedanta as religion has also paid full attention to the other aspect of revelation which deals with religious or spiritual life. It interprets and propounds the truths of religion that is lived and practised by the people and that also expresses itself in the form of religious beliefs. Philosophy is not concerned with this aspect of re- ligion or revelation. But it is directly concerned with the deeper aspect of religion, the spiritual religion which reveals the supersensible reality and truths. The philosophers of India have shown their deep commit- ment to this spiritual aspect of religion which constitutes its supreme truth. The supersensible dimension of reality cannot be known through sense-experience and reason. It can be known only through Sruti and can be reached and realised by a higher knowledge, paravidya, The Upanisads and the Bhagavadgita have revealed and propounded the nature of the Supreme Reality or the Supreme Being, Sat and other metaphysical and spiritual truths, and the Vedanta is directly based on them. But the great philosophers of the Vedanta could not afford to play the role of theologians, as they had to meet serious challenges from other schools of thought, namely, the Carvaka, Nyaya- Vaisesika, Samkhya, Buddhism, Jainism, etc. strictly on the basis of reason and logic. Thus, the intellectual atmosphere of India has from the very ancient times never been conducive to any systematic development of theology.